The AFP - Sierra Chapter is Celebrating 30 Years in 2018! 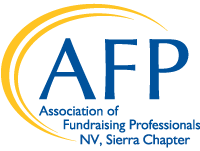 The Association of Fundraising Professionals (AFP) - Sierra Chapter was formed in 1988 to provide fundraising professionals in our region with quality fundraising education, networking opportunities and resources to implement the best practices in non-profit fundraising. Our Chapter offers a variety of educational sessions throughout the year for both AFP Members and the general non-profit community. As an AFP member, you receive discounted member rates at all of our events, as well as access to all the invaluable resources provided by AFP. Become an AFP - Sierra Chapter Member today! Learn more about the exciting activities offered by the AFP - Sierra Chapter.